Baptism is the sacrament of entrance to the community of faith. Presbyterians baptize adults on their profession of faith, as well as the children of church members. Many Presbyterians are baptized as infants as a sign of God’s love and in recognition of their welcome into our church family. What better way to show God’s unconditional love than to baptize a newborn baby? Children will speak for themselves and confirm their baptisms in a confirmation program during their teen years. Adults are baptized following instruction in a membership class. Baptism is celebrated in the gathered community of the church in corporate worship, generally on the third Sunday of each month. Contact Janice Teliczan for dates of baptisms and to arrange for the baptism of a child. Westminster Presbyterian Church offers many beautiful spaces for weddings for members, their children and grandchildren. Couples who wish to be married at Westminster should begin by contacting Vanessa Uzong to arrange a tentative date. The couple then will be put in touch with a pastor and the church’s wedding coordinator. Westminster’s music staff will assist the couple in selecting meaningful and appropriate wedding music. The many beautiful features of Westminster include the sanctuary (built in 1897 and listed on the National Register of Historic Places), the Gothic-style Chapel, the Möller Organ, and an extensive art collection. 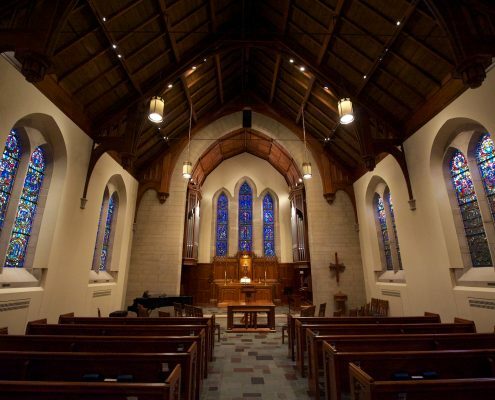 View and online, self-guided tour of Westminster church.